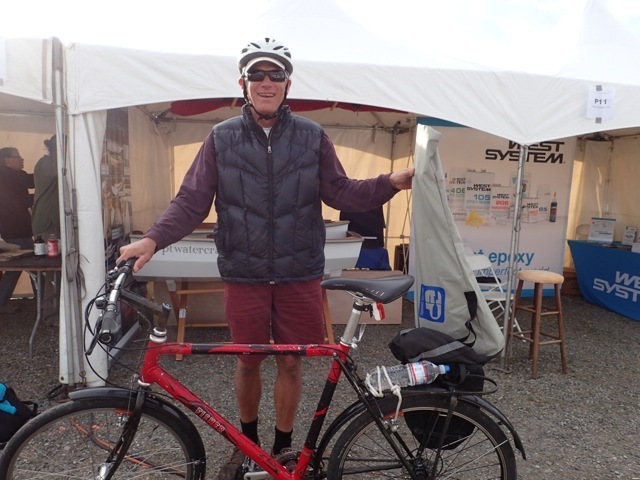 This September we had the opportunity to play with an EP Carry electric motor for the first time. Dinghy owners often ask about an outboard for the PT 11. Our preference is to discourage outboards on our dinghies because good rowing and sailing boats never make great motor boats. But some people really want to be able to use an outboard. That's understandable, but the fact is that the smallest gas outboard motors currently available are really too big for our boat; too much power and too heavy. Now there is an option we can support; the EP CARRY electric "outboard". All of the technical information about this innovative little motor can be found on the website ELECTRICPADDLE.COM. 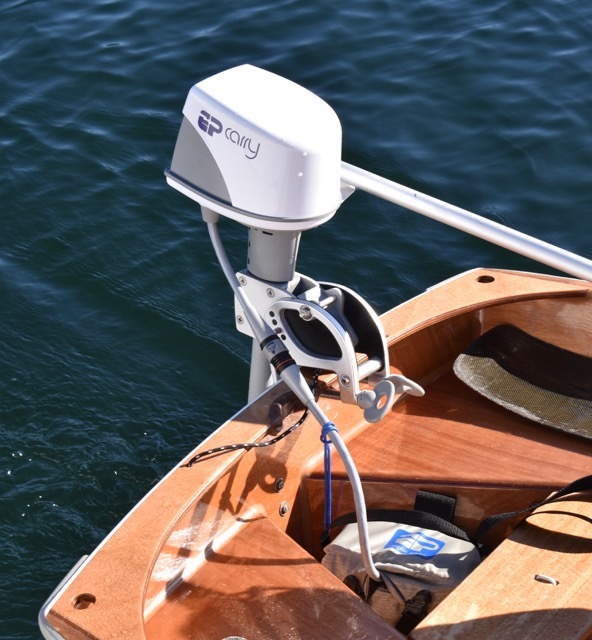 Though it is compared to a 1HP on their website, it has sufficient power to get the PT 11 up to a cruising speed of about 4 knots. 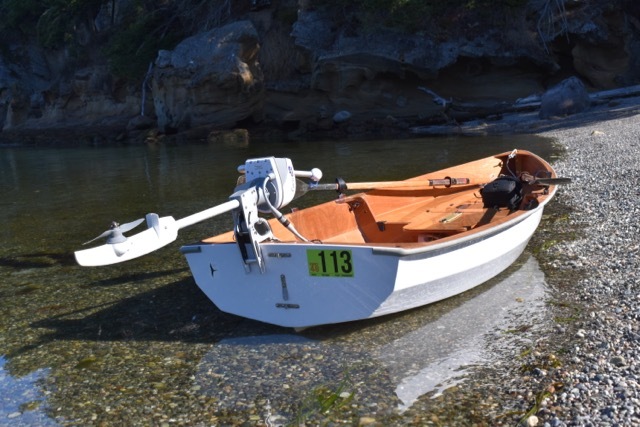 The USCG however, considers all small electric outboards as "2HP". Based on that formula, the PT 11 and PT Spear are rated for "2HP" so, the EP CARRY aligns with the Coast Guard figures. The amazing thing about this motor is that it weighs only 14.4 Lbs. This makes it very easy to mount and remove. The battery pack weighs 6.3 Lbs, making the total package less than 21 Lbs. There are several design features that add to the ease of handling as well. Our recent experience with the EP Carry was very positive and to my surprise, I caught Russell grinning after speeding off to visit other boats in the anchorage. "Mr. anti-outboard" was actually having fun and we enjoyed it further by taking a friend on an evening "cocktail" tour of Reid Harbor, a deep bay with lots of shoreline and many boats to observe. 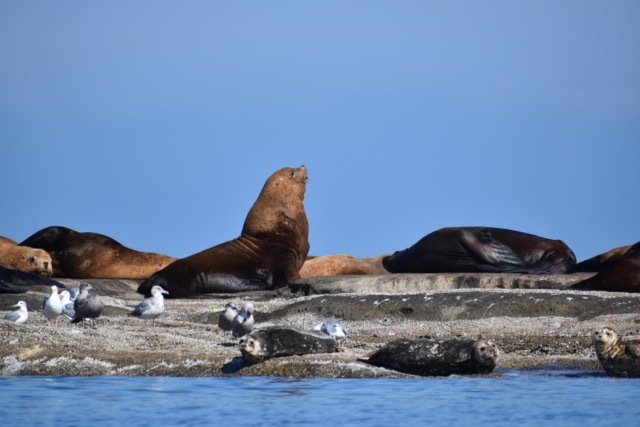 We spent a couple of days, driving along the shore of Sucia in the San Juans, in Shallow Bay making watery doughnuts, backing up, going forward, generally goofing off, and then venturing out to 'Danger Reef' to "brave" close proximity to a group of Stellar Sea Lions. We were pleasantly surprised by how far the battery went on one charge. You will notice in our video that we carried our oars with us but we did not need to employ them. This motor is not silent. Neither is it loud. Our lightly built plywood boat seemed to acoustically amplify the sound a little. Even so, there was no need to raise our voices for conversation. In fact, we could almost whisper and still communicate. This was a plus to me. Loud outboards in quiet anchorages are, in my mind, a real nuisance and many of us are familiar with boaters talking in their loud dinghies barely hearing each other and assuming no one else can hear them either...but of course we hear every word. Sound is a funny thing. 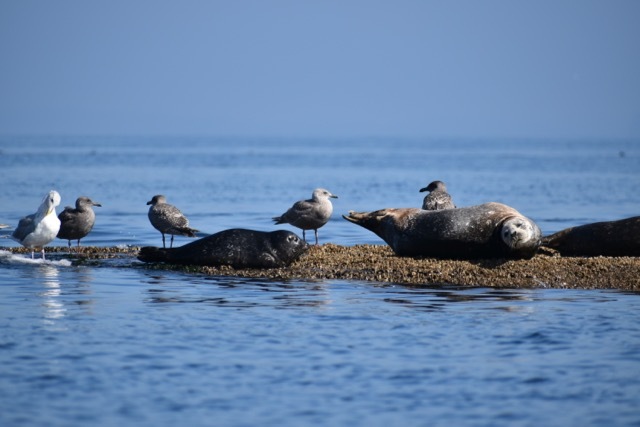 With the EP Carry, the birds, seals, and sea lions were undisturbed by our passage. It made it a great modus for exploring the nature around us. Another thing that is really attractive to us about this motor, is that even with our limited house battery power, we could re-charge the EP Carry Battery. It does require a 150-200W inverter, but this lithium battery requires a third of the power than comparable models to recharge. At home, it is simple to plug it into a normal outlet. Beyond charging the battery and rinsing the unit after use in salt water, there is virtually no maintenance. Yet another plus. When our EP Carry arrived at the door, unpacking it was quite amazing. The care taken to pack it and the detailed contents made for a well thought out and complete package. It was a positive reflection of Joe and Linda who have spent years perfecting their product. They, like us, had a vision that they worked and reworked in every detail. In fact, the original mount did not fit the PT 11 and now it does. Further, the EP Carry, designed right here in WA State, is assembled in the USA. It is yet another example of admirable American ingenuity with style and a small business making a positive difference in the world. Of all the outboards on the market, we feel confident that the EP Carry is a good fit for the PT 11.